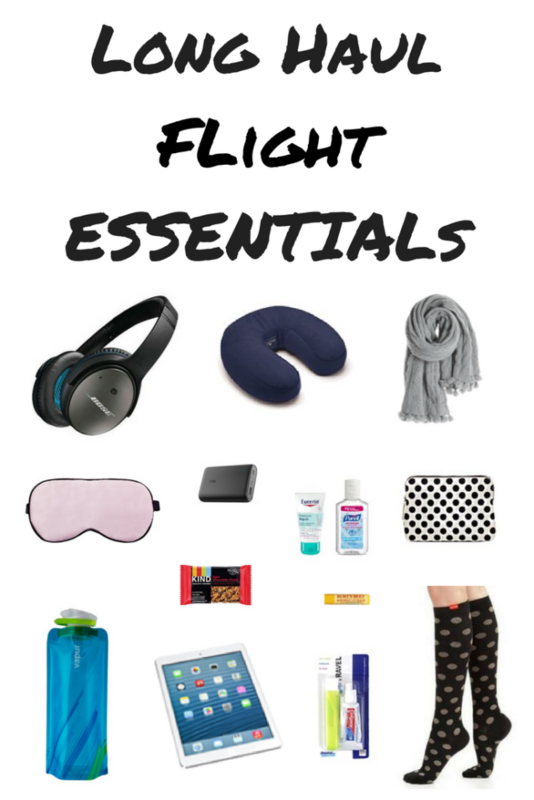 Long Haul Flight Essentials That Every Flyer Needs! Flying long haul in economy can be painful and uncomfortable but after years of flying, I have learned how to survive long flights and make the best of the situation. For starters, I have a list of long haul flight essentials that I always pack in my carry on bag for overnight or international flights. My long haul flight essentials list includes all the travel items I need to be comfortable and entertained on a long flight in economy. Here are 12 in flight travel essentials that every flyer needs on a long flight. Drinking water on long flights is crucial – because the air is so dry on airplanes, dehydration happens quicker when flying than it would on the ground. I always bring a reusable water bottle full of water when I board a plane which is handy if I get thirsty before drink service begins. During the flight, I ask the flight attendants to fill up my bottle so that I don’t use all those disposable plastic cups. I like Klean Kanteen bottles because they are insulated and keep my water cool. Airplane surfaces can be very dirty so I always bring antibacterial wipes or hand sanitizer with me when I fly. I use antibacterial wipes to wipe down my tray table, arm rests, seat belt buckle etc when I first board a flight and hand sanitizer to clean my hands before I eat. The air in the flight is very dry so lip balm and lotion are at the top of my in flight essentials list. Other than sleeping, the best way for me to pass the time on a long flight is to read a good book. While I prefer reading actual books, a Kindle E-reader is a space saver because I can download my favorite travel books, instead of bringing a bunch of books with me. I always bring an external battery to charge my phone and electronics because some airplanes don’t have power outlets in economy. I find it easier to sleep after I brush my teeth, so I always pack toothpaste, a toothbrush and floss in my carry on bag. Noise cancelling headphones are useful for blocking out noise which will help you sleep. These are the best headphones I have found. If you have trouble sleeping with lights on, pack an eye mask. Personally, I don’t need a pillow to sleep but I know a lot of people that can’t sleep well without a neck travel pillow. The Trtl Pillow and the J Pillow get good reviews. I always make sure to wear loose fitting and comfortable clothes when flying. The key is to wear layers so that you can adjust to the airplane temperature. Airplane cabins can sometimes be freezing so I never fly without a scarf (which can also be used to block out light in lieu of an eye mask). I also recommend wearing slip on shoes without laces so that you can take them off easily and put them back on when going to the bathroom. I always bring a pair of comfortable socks to keep my feet warm and clean when taking off my shoes in flight. While everyone is at risk for deep vein thrombosis (DVT) on long cramped coach flights, compression socks are a must if you are pregnant, older or have a history of blog clots. I always bring a few energy or granola bars just in case I get hungry between meal service or I don’t like the food. 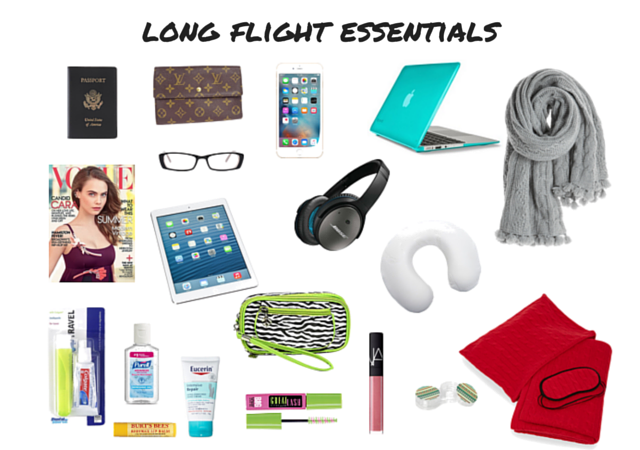 So this is my list of long flight essentials which are always packed in my carry on bag. 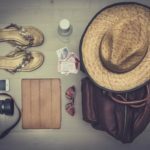 To make sure you don’t forget anything, I have a printable carry on bag essentials packing list which includes all my long haul flight essentials as well as other important items (such as valuables, medication, extra underwear, etc.) that need to be in hand luggage. Do you have any long haul flight essentials? So much stuff! I’m very tempted by those new neck wrap pillows but with 2 kids and travelling full time…can I justify carrying anything else? I already have 17 cuddly toys to pack. I agree with your whole list. Although I bring wet wipes, I prefer washing my hands in the bathroom because it gives me a chance to get up, walk around and stretch my legs. I used an eye mask for the first time on a recent long haul flight and they really do make a difference! Hand sanitiser is the one I usually forget and regret, great tip. I find exercising whilst on board is important too. I mostly just sleep to survive long haul flights but i agree with having a reusable water bottle and refill, refill, refill! Lip balm is also a must and compression socks saves my life!